We are far from where we may think we are. Several myths in popular imagination prevent us from seeing where the real barriers lie. As a result, we underestimate the effort needed to go from today to a future where every girl child in India is educated. According to a survey published by Save The Children, only 14 in every 100 girls in our cities reach Class XII. While ahead of rural India, where only 1 in 100 reach Class XII, this is still abysmal. 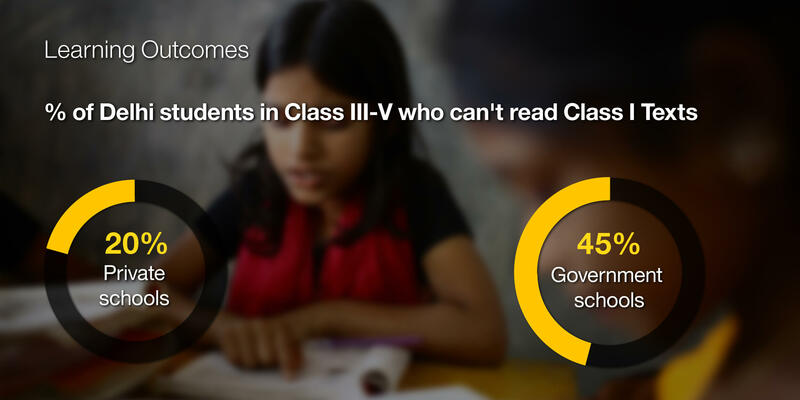 Even the Ministry of Human Resources data, based on school reports, shows that only 33% girls reach class XII. This is not to take away from the dramatic improvements in enrolment, which is almost 100% for girls at the primary level with more girls enrolled in primary schools than boys! Enrolment, however, is not the same as attending or completing school. A UNESCO study puts primary school attendance for girls at 81% and secondary school attendance at a mere 49%. While funds were an issue in the 1950s, over the last two decades public spending, especially on education for girls, has increased manifold. According to World Bank data, India spent 3.7% of its GDP on education in 2015 which is not dramatically lower than the global average of 4.2%. Moreover, several Indian states are unable to spend their budgetary allocation every year. Less expenditure does affect girls more than boys as it often means less infrastructure. For example, no separate bathrooms at school is often cited as a big reason for girls dropping out. Yet even higher spend has been unable to arrest drop-out rates and improve learning. In fact, learning levels for students are far behind those expected for their class and greater spend has not made a difference. Educators agree, not just in India but the world over, that the single greatest factor determining learning outcomes in early education is teachers. Kiran Sethi, an Ashoka fellow and educationist says, “Children, especially in younger years, learn a lot from human interaction, collaboration, emotions and verbal and non-verbal cues. Quality of teachers and teaching methods are the most important factors for learning outcomes.” And what our schools lack is teachers. According to the government survey of 2014-15, 54% of the 7.6 lakh primary-only schools have two teachers or lesser and about 6,400 of these have no teachers! In light of incredible improvements because of technology in every industry, one often assumes the benefits could apply to education equally well. One indicator is that global venture capital funding for K-12 education technology has grown at an annual rate of 48% over 2011-2015 crossing $ 3 Bn in 2015. Technology can indeed make a big difference and sometimes in surprising ways. For example, a 2010 study found that teacher absenteeism fell by 21% after the introduction of camera monitoring and linking of salary to attendance in rural Rajasthan. And no doubt, in the future a digital teaching system will radically alter circumstances. But for now, the greatest challenges India’s girls face have more to do with basic access than teaching technology. In 2010, the average number of school years was 4.1 for girls, while for boys it was 50% higher at 6.1. There remains a distinct gap between the two. While girls do outperform boys in pass percentages and merit lists in almost all board exams in every state, part of the reason is because so many drop out before the board exams. According to Census 2011, almost 20 million girls are denied education. At the time of India’s independence girls enrolment was barely in double digits and since then we have clearly come a long way. Yet the higher performance of girls is also telling of how much more they could achieve. These myths often lead us to believe that the issues around girl education are well on their way to being fixed. However, this is far from the truth. A new report by UNESCO on the state of global education recently stated that India is fifty years behind schedule in achieving the goal of universal education. Despite a great effort on the part of the public and social sector, progress is still slow. The challenge of ensuring education for all girls is deep seated and all around us – in our neighbourhoods and cities. Faster progress on girls’ education is important not just as a fundamental right of girls, but also for overall positive social change. UNICEF and WHO data shows that the health indicators—from infant mortality to immunization levels to vulnerability to abuse—of future generations is directly linked to the level of schooling of women. Debunking popular myths and accepting the challenges head-on is the first essential step in making India a better place for girls. Join the conversation. This article was produced on behalf of Nestlé by the Scroll.in marketing team and not by the Scroll.in editorial staff.